﻿Some of you probably know not too long ago Sigma was having a free shipping promotion so I snatched up this chance to get myself some of their brushes. I’ve read many good reviews about them and really wanted to try them. Well to let you guys know they’re great! I now use them as a part of my professional makeup kit and would definitely recommend them to other people. I ended up buying myself the complete brush kit without the brush roll (since I already got a brush roll) and the synthetic face kit (which is relatively new). All the brushes are of good quality and they’re super soft, they also don’t smell when you first get them so that is a bonus. I washed them and after they dried they are still as they were when I first got them. There was no shedding so that is definitely a bonus with me. I hate it when you buy nice soft brushes but then it sheds like crazy. 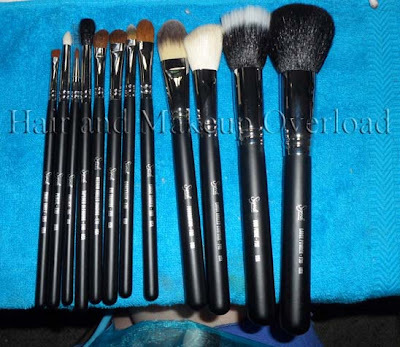 I’ve used them on friends and they’re definitely great for a makeup artist who is only just starting out and can’t afford to buy all the expensive MAC brushes. In my opinion they’re just as good as the MAC ones and I seriously can’t find anything to complain about them at the moment. I’ve already had them for about 2 weeks. If you’re not after a whole set then you can also buy them individually. The synthetic face kit is absolutely wonderful! They’re so dense yet they’re so smooth and soft that I couldn’t stop running the brushes on my hand. 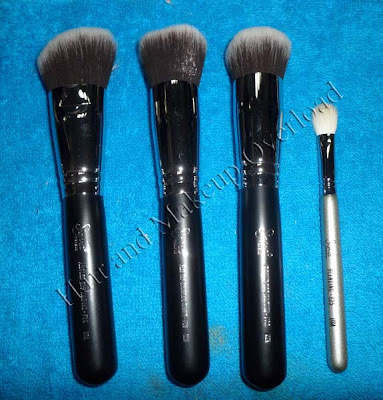 The silver brush was a free gift with the purchase of the complete kit and it’s a fluffy blending brush. Very similar to the MAC one and it works just as well, except it’s like a travel size of it so I’ll be adding that one to my travel brushes. NOTE: Sigma did not pay me to review their products, everything was bought with my own money and this review is based on my honest opinion on their brushes.